I was able to get the diagonal and star to work on Pull Me Close by holding the magnet on for about 15-20 seconds (way longer than the suggested 5-10 seconds). The chevron design was a bust. On a bright note, both colors are a beauty so I will use them as a "regular" polish. 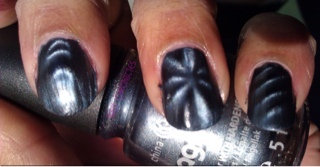 China Glaze magnetic polish is on sale at Sally's right now: buy 2 get the magnet free. 15-20 seconds? No matter mine weren't working...yours look great! Thank you but yeah I haven't got the patience..... not when my Claires magnets work in 5 seconds.